[New for 2013] Of all the things we cover on this blog, Dairy Queen has more facebook followers than all the rest combined.... but there is another company out there who has them beat by a half million followers. 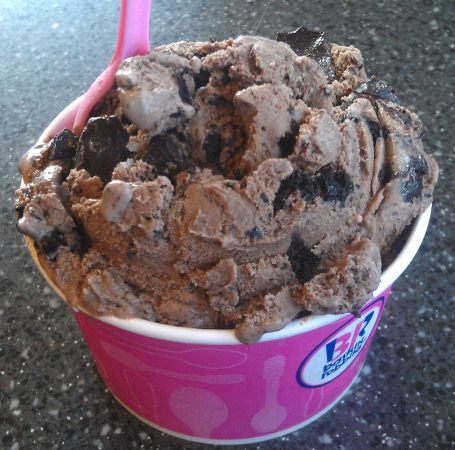 That would be Baskin-Robbins with nearly 7,000 shops in 50 countries. That's just crazy. 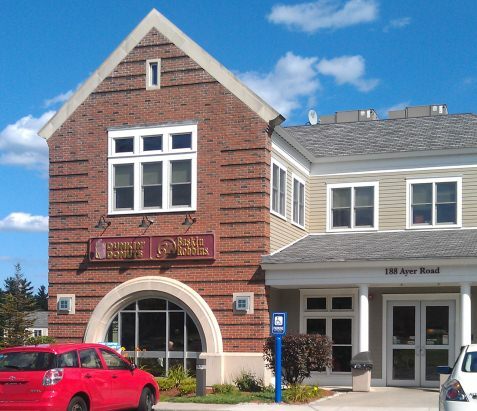 They are headquarter right here in my beloved Massachusetts (as part of the Dunkin Donuts family), but there is just one teensy tiny little problem here.... ummmm, there really aren't any Baskin-Robbins left in Massachusetts, almost all of them shut down. Clocking in at 45 miles away, I found one in Harvard, MA! So what could get me to go this far for ice cream? Why have I finally given in to temptation after all these years? I tried not to hype this one up too much in my head, but we finally made it to a BR and I gotta say, it was worth the trip to try this fresh take on my beloved Cookies 'n Cream ice cream. First off, it looks great and it tastes super fresh. 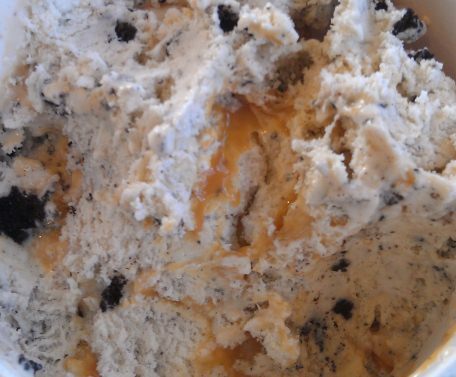 The neat thing is that this is still more or less cookies and cream but it has this nice caramel swirl that has salted peanuts buried in it. It totally rocks the classic CnC vibe while adding nice caramel undertones and then hits you with the salty peanuts here and there. It's really top notch stuff. Yeah, I completely inhaled this double scoop bowl of ice cream before my daughter was even half way done with her bowl (and that was after slowing down on the last several bites). Just look at the nice gooey swirl everywhere. I really did expect the caramel to dominate but no, it supports and enhances, it wins the day for me. I also adore the mix of big soft Oreo chunks mixed in with tiny crumbs everywhere. It's the way you make Cookies 'n Cream, no exceptions. Man I love fresh ice cream. My daughter "decided" to go with the OREO 'N Chocolate ice cream. I use quotes because she had wanted to just get regular Oreo ice cream, but I convinced her to try the chocolate version to be different. Well, it was different alright. I was kind of wondering why she wasn't saying much while I kept going "wow, that's awesome looking". It turned out that the epic looking fudge crackle swirl was a bit much for her. "How can a swirl be too much?" you ask, well, to be honest, it almost had a bit of an alcohol vibe to it. I know in reality it doesn't, but I'm not sure how else to describe the unique taste coming from this swirl. Just like my nutty Oreo, this small bowl is super fresh, top notch ice cream, but that fudge swirl was dominating everything. She was a trooper and finished it, but as her dad I did feel guilty for making her give up her beloved traditional Oreo only to be sideswiped by this complex upgrade. Now that we've actually made it to Baskin-Robbins, I realize that it is possible to get them on the blog from time to time. Not often, but when something unique comes up, I'm willing to venture out to show you guys what's new. As always, feel free to let me know if there is something in particular you want me on my next trip. That's so strange that BR is headquartered in MA but there are so few. That ice cream looks delicious. Don't feel too badly about having your daughter taste the chocolate version; you expanded her ice cream horizons! I bet she still enjoyed the BR experience with you. I have great memories of going there with my dad 40 years ago! I've been to BR a few times. I've liked what I've tasted, although I've only ever really had their Pistachio and Butter Pecan flavors. I remember both scoops being exceptionally small. I prefer a local Kolache store down the road from me that sells Hershey Products. Actually, that's one thing that would be cool to feature. Any places serving hand-dipped Hershey Ice Cream near you? @Anon: can't believe I found this one! 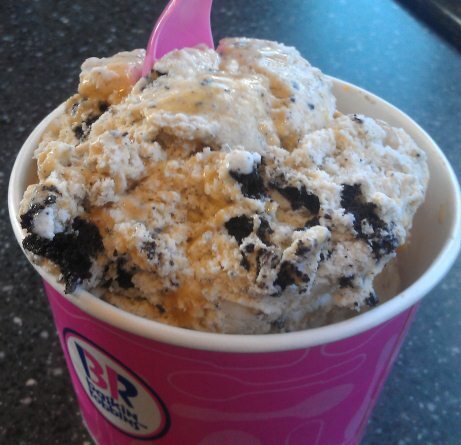 @Beth: Baskin-Robbins has a special surprise for my daughter so stay tuned for a special upcoming post. @Adam: There are a few places that serve Hershey's actually, unfortunately my first try was quite stale. We've also had a little trouble dealing with their reps, but look for us to try once again this fall.